108 cards (3 of each symbol in 6 colours). Players try to form as many Qwirkles as possible with their cards. The same symbol, but of different colours. The one who succeeds in forming the most Qwirkles wins the game. Shuffle the cards well. Each player is dealt 9 cards, face down. Place the rest of the cards face down in the middle of the table, to form the draw pile. At the start, all players pick up and look at their cards, looking for a row of the same colour or symbol. The player with the longest row of such cards (minimum 3) places this row of cards in the centre of the table as their first go (for example, 3 red cards with different symbols). If there is a tie, the youngest player goes first. The game then proceeds clockwise around the table. If no-one is able to make the first move, all the cards are returned to the deck, reshuffled then dealt out again. Each turn the player plays as many cards as possible form their hand, then replaces any cards played with new cards from the draw pile. Each turn the player must play at least 1 card (but see rules below on what to do if a player cannot play). On their turn a player can start a new row, or add cards to the existing rows on the table . All the cards on the table can also be rearranged in order to help play cards. A row consists of a minimum of 3 cards either of the same symbol, or the same colour. A row cannot have 2 identical cards in it - for example you cannot have 2 blue diamonds in the same row. To start a new row, a player must play at least 3 cards sharing an identical characteristic, or take cards from other rows already in play. In this case, the player must add at least 1 card from their hand. In rearranging rows on the table, the player must ensure that every row remaining on the table at the end of their turn is valid. In any row of the same colour, all the shapes must be different. For example, you cannot have 2 squares in a row of yellow cards. In any row of the same shape, all the colours must be different. For example, you cannot have 2 yellow cards in a row of squares. In order to have a better overview, you can position the cards so that rows of cards that share symbols are in one place, while rows which share colours are in another. You can play different cards into different rows all in one turn. You can also rearrange the cards on the table in any way you like, provided that at the end of your turn all the rows are valid combinations of at least 3 cards. 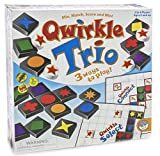 At the point a player completes a row of 6 cards, they have formed a Qwirkle. The player takes these 6 cards and stacks them in front of themselves. 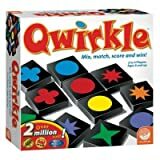 These should be stacked in separate piles so that all the players can see how many Qwirkles each other has. Players can at any time check which cards are already out of play in completed Qwirkles, including those of other players. for this reason, it may be helpful to stack completed Qwirkles face up, and overlapping, so that all cards in the stack can be seen by all players. Should the rare situation arise that a player cannot play any cards, then they must show their hand to the other players. If another player can find a combination that can be played, then the player must make this play, even if they do not like it. If no plays can be found, then the player draws 9 new cards from the draw pile, and shuffles their old cards back into the deck. The player then plays their turn as normal. When the last card is drawn from the draw pile, all the players (including the one who drew the last card) have one last turn. 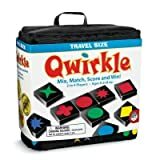 After that turn, the player with the most Qwirkles is the winner. It is possible for the game to end in a draw.